If God had intended our days on earth to be easy, they would be. 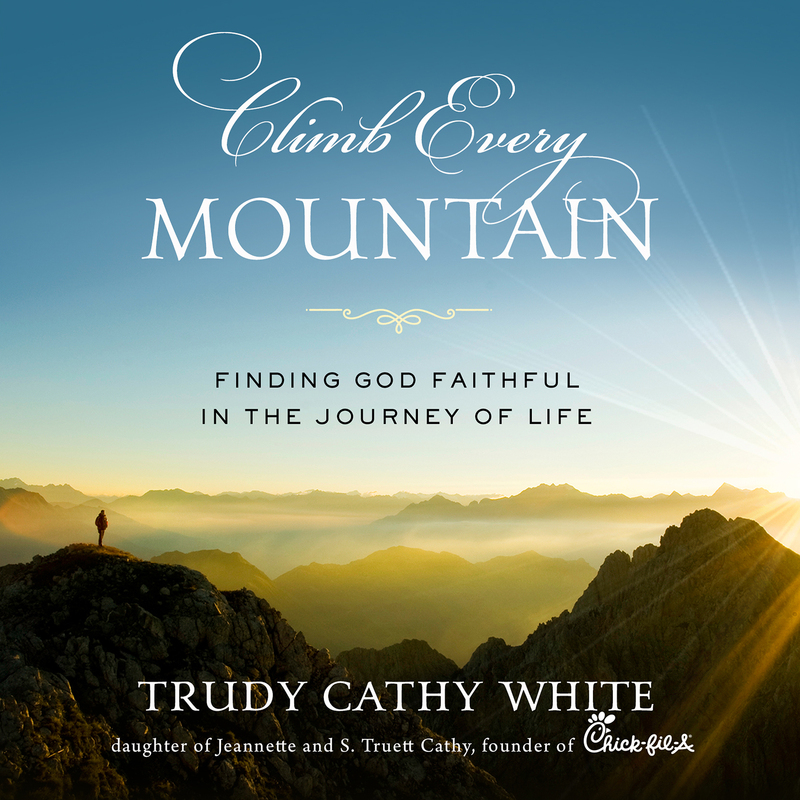 In Climb Every Mountain, Trudy Cathy White invites you to join her on an expedition toward, up, and over the mountains most of us face in life—challenges such as figuring out our identity in Christ, understanding the gifts and calling God’s given us, godly parenting, and leaving (and living) a legacy for others to follow. She’ll also guide you through the rocky terrain of adversity, aging, and grief. With funny, heartwarming, and often-heartbreaking honesty, Trudy will reveal the principles God’s taught her through a lifetime of climbing the most challenging—and beautiful—mountains she ever imagined. God’s called us to join Him on the mountaintop of victory but getting there won’t be easy. We can’t wish, hope, or even pray our way to the top. We have to climb. Climb Every Mountainis the inspiring true story of Trudy Cathy White as she shares her life of climbing hermountains—literal and spiritual. As the daughter of S. Truett Cathy, founder of Chick-fil-A, Trudy learned how to climb mountains from her parents’ examples. Trudy learned that, as we climb every mountain withthe Lord, we move closer and closer to whoHe wants us to be and where He wants us to be. No matter how difficult the climb or how sweet the rewards seem today, the most glorious life we could ever imagine is still to come—just over the next peak. Trudy Cathy White is a native Georgian and the only daughter of Jeannette and S. Truett Cathy, the founder of Chick-fil-A, Inc. An ambassador for the family business, Trudy has held various roles within Chick-fil-A including that of restaurant operator at just 19 years old. Trudy and her husband, John, served as missionaries in Brazil and co-founded Lifeshape and Impact 360 Institute. A developer and encourager at heart, White served as the Director of WinShape Camps for Girls from 2003-2017. She is a speaker, author, dedicated wife, mother of four, and grandmother of fifteen. Every day she is fueled by her passion to be intentional with her influence. In everything Trudy does, she is led by her commitment to obey God’s leadership, nurture family relationships, and promote godly character in the next generation. More information on Trudy’s life and family can be found at trudycathywhite.com.